Sheriff Steven J. Kieliszewski is a life-long resident of Alpena County and grew up in Maple Ridge Township. Steven has been married to his wife Erin for the last 28 years and they have six children including four sons and two daughters. 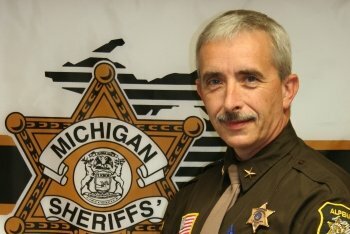 Sheriff Kieliszewski is a 1982 graduate of Alpena High School. He received his Associates degree from Alpena Community College and then graduated with a Bachelor of Science degree in Criminal Justice from Ferris State University in 1986. Steven also began his law enforcement career at the Mackinaw Island Police Department in 1986. He transferred for a short time to the Otsego County Sheriff’s Department in Gaylord, but then quickly arrived back home and started working at the Alpena County Sheriff’s Office in 1987. Steven rose from the rank of Deputy Sheriff to Sergeant in 2000, became Undersheriff in 2002 and then became Sheriff in 2005. He is currently the 31st Sheriff of Alpena County. Accident investigations is one of Sheriff Kieliszewski’s areas of expertise. He has taken numerous courses over the years including accident photography, perspective grid mapping, tire dynamics, commercial vehicle, motorcycle & snowmobile accidents, to name a few. With this extensive accident investigation training, Sheriff Kieliszewski has used his expertise to train over 100 officers in numerous law enforcement agencies in Michigan and Illinois. A couple of Sheriff Kieliszewski’s proudest professional achievements include starting the Alpena County Search and Rescue Team and re-establishing the Sheriff’s Dive Team. The Search and Rescue team is a 100% volunteer driven, professional trained organization serving mostly Alpena, Presque Isle and Montmorency Counties as well as other parts of Michigan. This team strives to execute methodical searches to locate lost or missing persons including Alzheimer’s patients, missing children and hunters, as well as many others in need. The Dive Team consists of current Alpena County Sheriff’s personnel that are outfitted and trained with the latest equipment and technology. They use many tools that allow the team to achieve success in their operations which are performed 24/7 year-round.